This lovely salad is ideal for lunch or as a side to any dish. Easy to prepare and can be served cold or at room temperature. 1. Bring a large pot of water to a boil. Add quinoa and simmer until fully cooked for about 15 minutes. 3. Drain and return quinoa to pot. Cover with a lid and let it sit for 5 additional minutes. 4. Fluff with a fork and transfer to a large bowl or sheet pan to cool. 5. 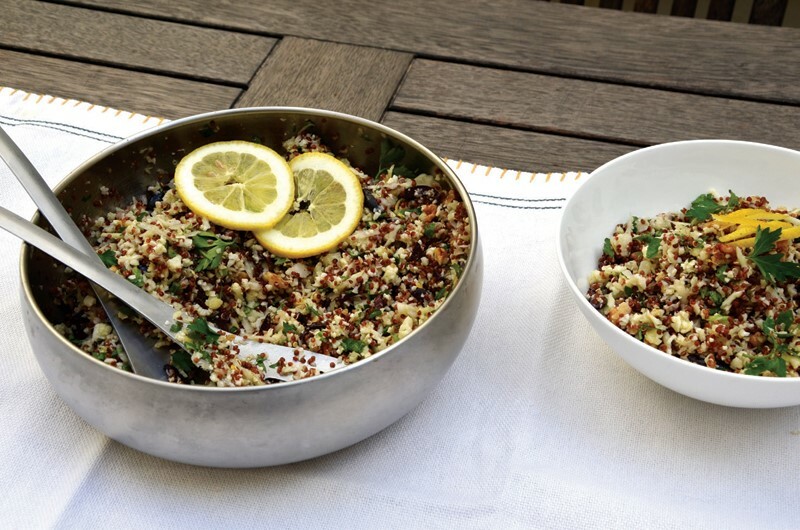 Combine cooled quinoa and the remaining ingredients in a large bowl. 6. Season with salt, pepper and more lemon juice if desired. 7. Transfer to a large serving bowl or platter, and scatter parsley leaves over. Serve and enjoy!